Kre Alkalyn creatine has been on the market for awhile now. Although many have probably tried this new form of creatine, many more probably still have not. I was originally introduced to Scifit's Kre Alkalyn 1500 creatine caps by my contact at Sci-Fit - of course I've heard of kre alkalyn creatine long before that time, however, I was skeptical, and didn't pay much attention to it. 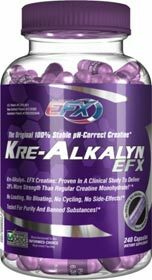 Kre Alkalyn creatine is stable in water because its PH buffered! Long story short, I was convinced to give KreAlkalyn Creatine a shot, and after that, I really had to change my views on this new type of creatine. Kre Alkalyn was discovered by Jeff Golini, who also discovered Arginine Alpha Ketoglutarate (AAKG), a nitric oxide amplifying agent. Jeff introduced a new product testing technology called NIR (near infrared analysis), which is now heavily used in the pharmaceutical and supplement industry. Kre Alkalyn Creatine was discovered while doing routine purity and stability tests on creatine using NIR. Kre Alkalyn was eventually awarded US patent #6,399,661. The research provided to receive this patent had shown that creatine's speed of conversion to creatinine is related to the pH of the liquid used for mixing - I'm sure most of us know that creatine breaks down to creatinine when mixed in liquid, which is a useless compound. The research demonstrated that the lower the pH, the faster creatine converts to creatinine, and it also found that conversion rate to creatinine slows as the pH of the creatine itself is raised above 7. At a pH of 12, creatine stops converting to creatinine. So essentially, Kre Alkalyn Creatine is a pH buffered creatine with a pH above 12. As a result, it remains stable when mixed with liquid. What significance does this have for bodybuilding? With a buffered pH, the Kre Alkalyn creatine we consume remains completely stable and reaches muscle cells at full strength. You will notice the same types of results as normal creatine (if not better). Some individuals tend to get bloated with creatine monohydrate, but with Kre Alkalyn, there's no bloating. While I can't vouch for this since I don't bloat with regular creatine, but I've had many users tell me that they don't bloat with Kre Alkalyn creatine. Some individuals also tend to get upset stomach with regular creatine, but with Kre Alkalyn creatine, that shouldn't be a problem anymore. Like I said above, I was skeptical about KreAlkalyn at start, but was convinced to give it a shot by my contact at Sci-Fit. He told me it was a very new product at SciFit, that it works, that I only need to take very small amounts, and yadiyadiyada... So, I ordered 2 bottles of Sci-Fit Kre Alkalyn 1500. Each bottle of Kre Alkalyn 1500 has 120 caps, and the bottle instructions suggested 1 to 2 caps twice daily. So setup my schedule to take 2 caps 30mins before workout, and 2 caps after workout. This works out such that each bottle lasts me a month. After just the first 3 to 4 days, I start noticing the effects - just like any other creatine! Except the fact that I'm only taking 2 caps each serving, or only 1.5grams per serving. So in short, Kre Alkalyn works, and works great - all its claims are true as well. I was quite surprised myself how well it worked. As well, Kre Alkalyn creatine's benefits such as no bloating and no upset stomachs is a major plus for individuals who tend to get bloated and/or get upset stomachs with regular creatine. Considering the fact that you only need to take small amounts of Kre Alkalyn per serving (1 to 2 grams), this is the only creatine product that I would ever buy in pill form. I can't imaging downing 5 to 8 pills of regular creatine pills each serving! Taking only 1 to 2 pills of kre alkalyn is very manageable - the pills are quite small. Another plus of Kre Alkalyn is that it isn't expensive at all. SciFit's Kre Alkalyn 1500 (120 cap bottle) goes for around $30 at retail, but you can get it online for only $25.